I made this piece as a response to the catastrophic Nepal earthquakes of April 2015. I lived in Nepal in 2007, and feel profound love for the place. For the five months prior to my exhibit of the bowls at Real Art Ways in Hartford, CT, my work on this project served as a daily contemplative “accumulation” practice of throwing and trimming on the potter’s wheel - miniature-sized bowls - evocative of the offering bowls used for sacred substances that are lined up in front of the stupas and statues inside many of the temples in Nepal. Partly an act of devotion to my spiritual community and Buddhist teachers there, and partly a pro-active “social sculpture,” I set the intention early on to offer these bowls to the public as a gift, as a reminder of the fragility of our worlds, and as an opportunity for people to practice generosity themselves. 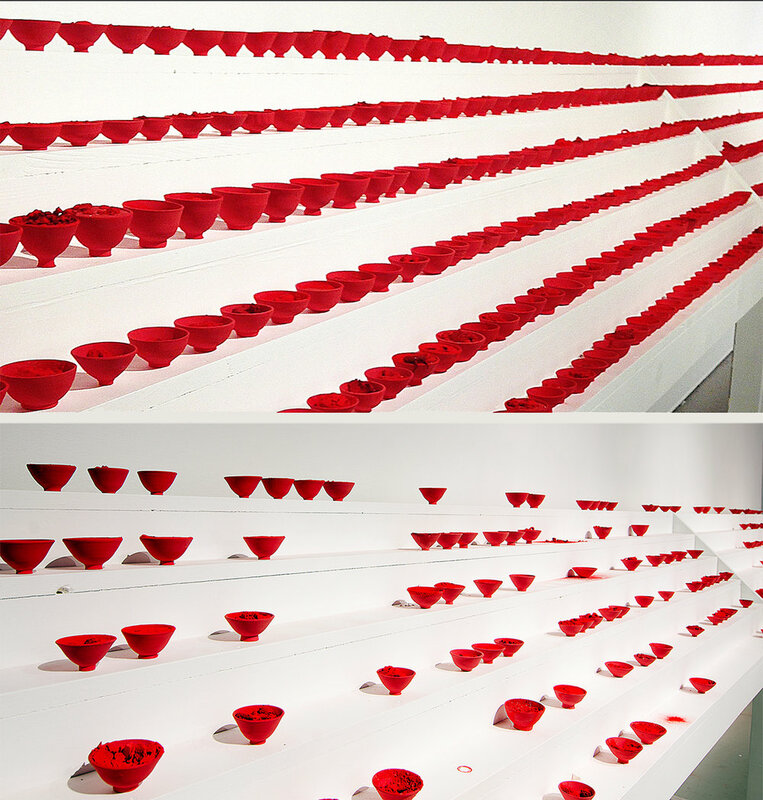 I displayed 1,080 bowls. The additional 80 were included to make up for errors and imperfections in the practice of the accumulation of 1,000 bowls. This follows a numerical order traditional to Vajrayana Buddhist practices. 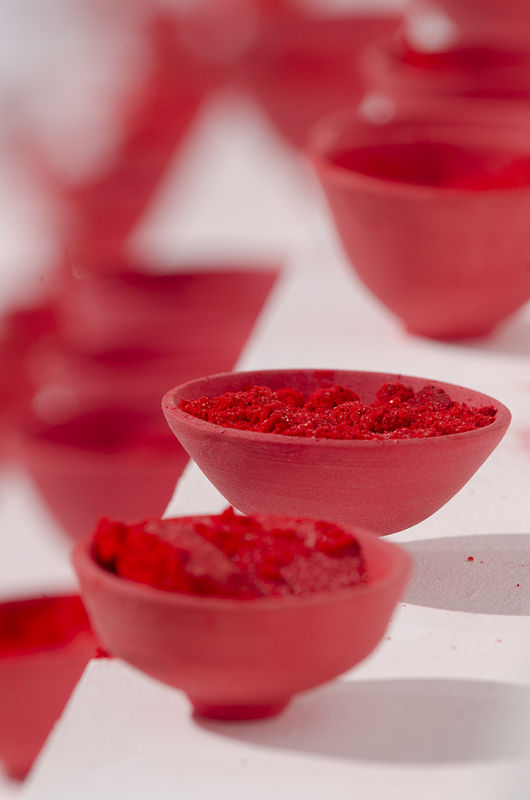 Each bowl served as a container for a delicate, fractured “landscape” composed of vibrant red-pigmented powder, sand, and bits of clay sculpture. In Nepal, the color red signifies sacred space, and a coating of vermilion powder (sindoor) adorns sculptures at sacred sites. In my piece this red powder, combined with varying amounts of red sand and clay fragments, became symbolic of the very soil upon which the country needed to be rebuilt. 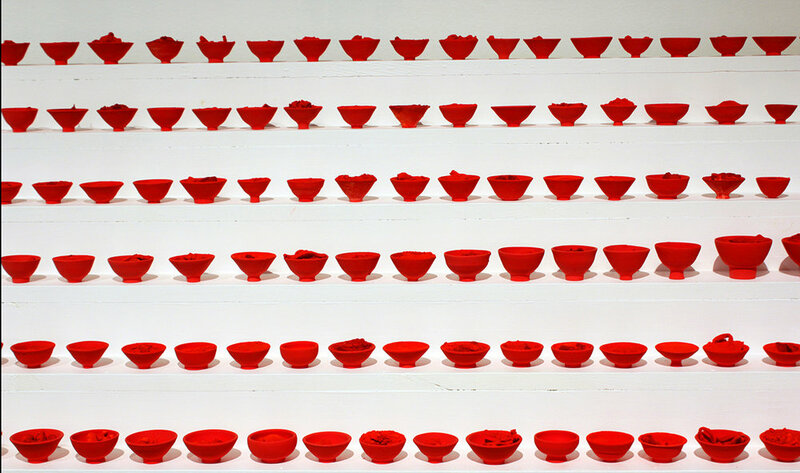 The 1,000 Offering Bowls for Shedrub Ling were on display, in their complete form, from October 13, 2015 to January 16, 2016. From January 16 - February 7, 2016, the community of Real Art Ways could participate in the "gift exchange" aspect of this work. They could receive a bowl - or two - or, in some cases, thirty - from the installation, and give an offering toward the rebuilding of Ky-Nying Shedrub Ling and Nagi Gompa, a monastery and nunnery located in the Kathmandu Valley of Nepal, which required rebuilding (still ongoing now) due to damages sustained from the earthquakes and aftershocks. 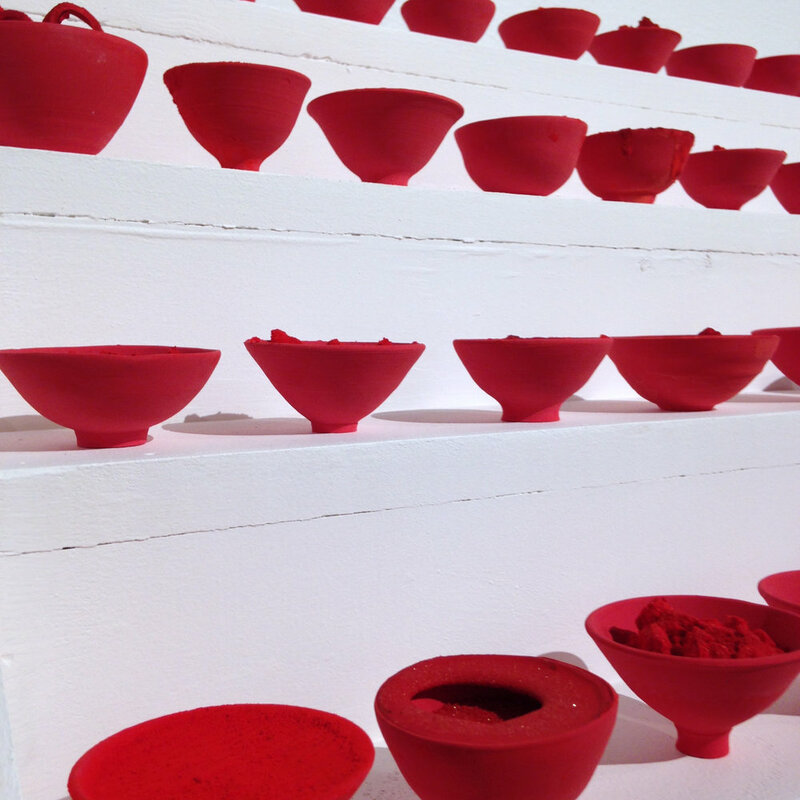 During these three weeks as the installation shifted and spaces opened up, new visual rhythms and orders were created on the shelves, some of the bright red powder spilled, and participants brought the bowls into their own private spaces. By the concluding day of this participatory aspect of the project, less than 100 bowls remained. A community emerged from these exchanges, who collectively gathered close to $3,000 toward the re-building the sacred spaces of Ky-Nying Shedrub Ling (the monastery) and Nagi Gompa (the nunnery).